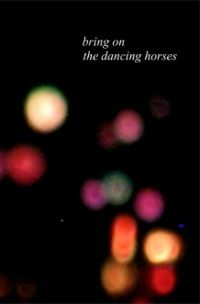 Bring on the dancing horses - ZineWiki - the history and culture of zines, independent media and the small press. Bring On The Dancing Horses is the narrative of a bicycle trip down the east coast of the United States, made of two major components: a lengthy stay in a squat known as Bowery Manor in New York City's Lower East Side, and meditations on the destructive nature of civilization, both in terms of its effect on the planet as well as on the psyche of every person and community who exists within it. Written in a non-linear form, this travel zine describes the beginnings of a relationship with a person who the writer meets while staying in New York, frequently bouncing back and forth between theories and poetic descriptions of events taking place along the bicycle trip. Events written about in this zine include sleeping in abandoned houses while traveling, squatting a vacant community center in New York City, dumpster-diving and living on the excess of the city, and generally existing in a way that consciously seeks to minimize capitalism's restraints on passion and community. The author remains dedicated to the DIY nature of zines, and limits the number of copies made to only what can be printed using scams at corporate photocopy centers. Aside from mailorder, distribution of the zine is focused on smaller towns where zines can be left in free piles. Bring On The Dancing Horses later became incorporated into Drugs And Daydreams: The Book!, a handbound hardcover book compiling several zines by the author of B.O.T.D.H. and info on Drugs And Daydreams: The Book! can be found at: Drugs And Daydreams: The Book! This page was last modified on 1 October 2010, at 13:30.